As time goes on, more people are making the switch from standard cable TV to a smarter, more practical method of enjoying all their favorite high definition movies, television shows, and entertainment. Known as a streaming media player, box, or device, they totally transform the way you enjoy HD content by connecting to your WiFi network and giving you access to a wealth of streaming apps, games, movies, and more. In 2016, there are several streaming media players that deliver top of the line performance with no compromises over your local cable company. We’ve been receiving a lot of inquiries from our readers asking which ones are worth the money. We’ve narrowed down a few devices that really stand out in terms of top of the line features and overall value paired with performance. 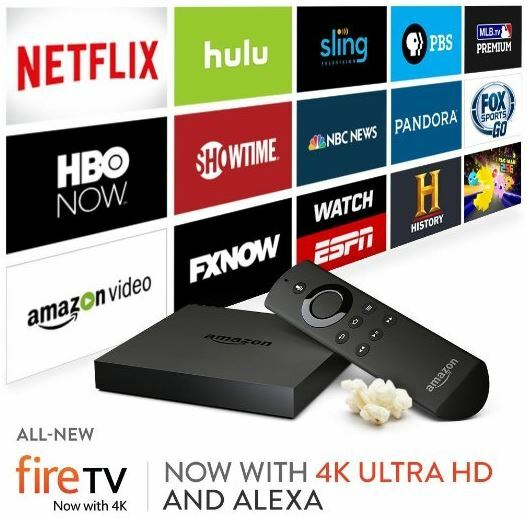 Built with a Quad-core 64 bit processor, 2 gigabytes of memory, and 8 gigabytes of internal storage, the Amazon Fire TV Streaming Media Player is built to impress with the ability to stream both 4k Ultra and 1080p HD content, giving you the best true-to-life image quality that technology can offer. Fast and fluid operation and browsing with no latency and virtually no wait time. It delivers more processing power than their previous version which gives it a huge advantage over competitors. Fire TV gives you the perfect and affordable opportunity to cut the cable cord and get rid of that expensive monthly contract. Best of all, you can still watch live television with NBC News, NBA, and a wealth of channels using Sling TV. Some channels include ESPN, Cartoon Network, CNN, HGTV, AMC, A&E, and others. Gives you television on your terms with access to a massive library of apps like Netflix, Amazon Instant Video, Hulu, HBO Now, Showtime, and more. No more manual searching, simply hold down a button and speak into the remote control to search for anything you’d like. It uses voice recognition software so you don’t have to type anything. Alexa is now included with the Fire TV so you can even check sports scores, weather, and even play your favorite music on command. Enjoy over 800 full featured video games in a range of categories from puzzles and strategy, to simulators, board games, racing games, and much more. If you’re a subscriber to Prime, you’re given access to an unlimited amount of Prime videos, and millions of songs with Prime Music. With the use of a Micro SD card, you can easily expand the internal storage up to 128 gigabytes. Although this card is sold separately, the price of microSD cards have gone down substantially over the last few months. Integrated dual band 802.11ac Wifi easily connects to your home network in seconds. If WiFi isn’t your thing, you can plug it directly into an Ethernet port using a Cat-5 network cable. The Roku has been a very popular device for the last few years. Their latest version, the Roku 4 Streaming Media Player showcases how far this little box has come. Built to deliver amazing 4k Ultra HD, you’re given access to over 2,500+ streaming channels for endless entertainment. Works with both 4K and 1080p to give you the latest in high resolution content with incredible clarity. The Roku 4 will automatically detect your TV’s hardware and make sure the best picture is always displayed. Comes included with a remote control that has a built in microphone for voice searching. Simply speak into the remote and you’re given a list of results by various titles, actors, directors, and more. There’s even a headphone jack so you can listen to your TV at night without disturbing your partner or your kids down the hall. Never lose the remote again. One thing we really don’t like about the Amazon Fire TV is the small remote that can easily be misplaced. Roku integrated a lost remote feature so if you ever lose it, simply press the small button on top of the box and it will tell you where it’s hidden. Gain access to the “Roku Feed”. It enables you to follow TV shows, movies, actors, and directors to get up to date automatic alerts when new content is available. If you’re trying to keep an eye on the price of things, you can even be notified when the price of certain content drops. Quad-core 32 bit processor with 512 megabytes of memory. Although this isn’t a ton of memory, it seems to do just fine without any latency or loading/streaming speed issues. Built in dual band, dual antenna Wifi that utilizes the latest 802.11ac standard with MIMO technology for a fluent connection. To give the best entertainment experience possible, NVIDIA has created the Streaming Media Player to deliver a virtually unlimited amount of entertainment in a wide variety of verticals. With it, you can enjoy shows and movies in 4k Ultra or 1080p HD, whicever your hardware supports. With a Quad-core 64 bit processor, 3 Gigabytes of memory, and 16 Gigabytes of internal storage, you won’t experience any lag, long load times, or extensive waiting no matter what content you’re streaming. Utilizing the latest 802.11ac Wifi standard, you can easily connect to your home Wifi and gain access to literally thousands of channels between television, radio, music, sports, and more. You can use Google’s advanced voice commands to do all of the work for you. Speak directly into the remote and you’ll get personal recommendations that are tailored to your interests. With this, you can even cast photos from your smartphone, PC, or other compatible device. Enjoy rich 7.1 Dolby Surround Sound with 5.1 pass through for theater quality sound. Although the remote is sold separately, it’s a desirable shape that looks similar to an Xbox controller. This excels with video games since you’re given access to a wide library of free and premium Android games. Sold standard with 16 Gigabytes of storage, however you can opt to purchase the 500 Gigabyte version for an added $100. Connect to a massive library of popular and niche apps including Hulu, Netflix, Sling TV, Disney, Showtime, Pandora, Vevo, Plex, PBS Kids, and more. Whether you’re thinking about cutting the cable bill or simply upgrading your home entertainment streaming options, these are the three streaming media players that stand above the rest. All are built with Quad-core processors and have the ability to play 4k Ultra HD with surround sound audio, giving you a theater-like experience in your home with plenty of additional functionality. Listening to music, streaming movies, watching television shows, and playing video games give these devices plenty of desirability for any household who enjoys the latest entertainment.